America’s struggles with race and racism are never completely out of the news. But it is hard to remember when a series of stories have given this issue such resonance, whether in the rulings of the Supreme Court on affirmative action and voting rights, a tense trial in a Florida courtroom and even the racially insensitive comments of a celebrity chef. In the wake of the election of the nation’s first black president, African Americans’ sense of the country’s – and their own – progress improved markedly, as a 2010 Pew Research Center report documented. To some extent, these more positive views endure: Our June survey found that blacks (36%) were far more likely than whites (19%) to say that economic conditions were excellent or good, even though the unemployment rate for blacks was roughly double that for whites. Yet the good feelings among blacks after Barack Obama’s election co-exist with a persistent belief that discrimination and unfairness remain a part of life for African Americans in this country. To take a recent example, in May fully 88% said there was a lot or some discrimination against blacks, with 46% seeing a lot of discrimination. 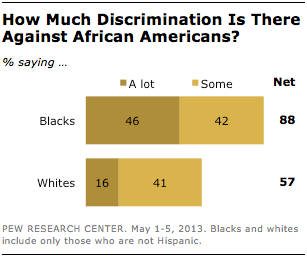 A majority of whites (57%) also saw at least some discrimination against blacks, but just 16% said there was a lot of discrimination.